Probashbangla24 online Desk : Japanese Prime Minister Shinzo Abe departed Tuesday for a European tour that will see him visit Spain, France and Belgium for a series of summit talks and to attend the Asia-Europe Meeting (ASEM) in Belgium. 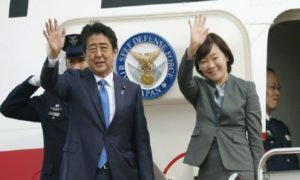 Prior to his departure, the Japanese leader said that he will during his five-day trip underscore the importance of a “free, fair and ruled-based economic order,” amid rising concerns about global protectionism. In France, President Emmanuel Macron will host Abe, with a number of pertinent issues including Japan’s free trade agreement with the European Union and Japan’s push for fair and open trade likely to be high on the agenda, sources here said.